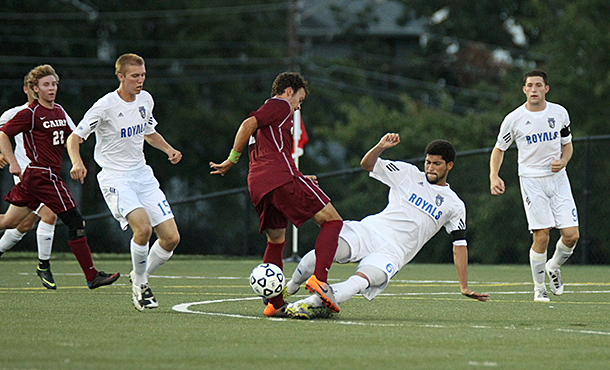 Chris Downs (sliding) and the EMU men's soccer team open the 2014 season on Friday, Aug. 29, at 2:30 p.m., at Mary Washington. His full name is Christopher João Downs Villegas, but to members of the Eastern Mennonite University men’s soccer team, he’s simply known as Chris. And to competitors around the Old Dominion Athletic Conference, João “Chris” Downs is regarded as one of the top defenders in the league. The Costa Rican-born Old Dominion University transfer, who joined EMU following a freshman campaign with the Monarchs that was completely wiped out when he tore the ACL in his right knee, earned first-team all-league honors last year and will begin his senior season when the Royals visit Mary Washington in Fredericksburg on Friday. Pronounced JAY-ow, João — a Portuguese surname – is what the 6-foot-2, 190-pound Downs said he prefers to go by. But the difficult spelling and pronunciation of the name led him to adopt “Chris” in Harrisonburg for the sake of simplicity. Downs was born in rural Limón, Costa Rica, and his father, Cristobal, who now works as a port agent in the Central American country, has raised cattle for both dairy and meat products as a hobby since Chris was a boy. In fact, Chris Downs said his father sold “a couple” of his livestock to pay for his son’s plane ticket to the United States when he left for ODU prior to the 2011 season. That background, Mast said, made Downs’ transition to the beach life in Norfolk – his first time being in the United States – immensely more challenging. Downs said he ended up with the Royals after his one-year scholarship at ODU was not renewed following his ACL injury. EMU turned out to be the one and only program Downs visited after leaving ODU, too, and Mast credited that to the down-to-earth atmosphere in Harrisonburg and its surrounding rural areas. Now at age 24, Downs – who admits his knee still gives him problems from time to time – is ready to play his final competitive season of soccer before hoping to parlay his eventual liberal arts degree into a sports management career. Eastern Mennonite, picked to finish ninth this fall in the 12-team ODAC, was 5-13 a year ago and is entering its 24th season under Mast. During that time, Mast said he’s had “at least” 20 foreign-born players compete at his program. Mast added another international athlete prior to this season in sophomore attacker Juan Luna, a Mexican-born former kicker on the Stonewall Jackson High School and James Madison football teams. Luna and Downs, who along with student assistant Juan Flores are the only Spanish-first speakers in EMU’s program, often find themselves battling head-to-head in practice.